If you have access to chickens, and to a stick of chalk, I urge you to try something. Sit the chicken down on a pavement. It will attempt to flee, and so some form of courteous restraint is probably advisable. I can confirm that such measures will not be required indefinitely. Observe carefully which way the chicken’s beak is pointing. And then, using the chalk, draw a straight line on the pavement, heading away from the beak directly in front of the chicken for about a foot. For some unfathomable reason, this action hypnotises the chicken. It will, experts say, remain immobile for something between 15 seconds and 30 minutes. The phenomenon has a name: tonic immobility. It is said to be a natural state of paralysis brought on when the chicken perceives a threat. I could not begin to venture a reason why a chalk line in front of a chicken would induce a feeling of threat. If any of us, as science strides forwards in leaps and bounds, are ever given the chance to spend even ten seconds inside a chicken’s brain, I would posit the first thing we should investigate is this. Though if I were to say chalk was a totally unthreatening substance to a chicken, I would not be being entirely honest. It is true that eggshells are made of a large proportion of chalk. But surround a chicken with chalk and immediately you will begin to see ill effects: their feathers begin to fall out. This poses a problem for the dwellers of our White Cliffs, here in England. They are white because they are composed largely of chalk. This was a tricky predicament for one notable resident of the White Cliffs: Noel Coward’s breakfast must, every day, consist of fresh eggs. Fiercely patriotic and uncomplaining, the playwright,composer, director, actor and singer had had merry hell played with his living arrangements during the war. His endlessly stylish and comfortable Kentish home, Goldenhurst, had been trashed by army occupation and needed a complete refit, and for this copious amounts of cash would be required. While Coward waited for this funding to materialise, he looked to the sea: to St Margaret’s Bay, just along the way from Dover. The nearest house to the sea was so close that waves lapped at the bedroom walls. But it was sadly dilapidated: the military had used it in training for D Day. There was no heating and lighting and all the windows were broken. Coward set about rectifying this, installing mod cons and painting the white house top to bottom. And the chickens turned out to have many mouths to feed. The glitterati descended wherever Coward went. Katharine Hepburn and Spencer Tracey; Gertrude Lawrence and Daphne Du Maurier; they were all guests at White Cliffs. Imagine Coward’s consternation, then, when his chickens’ feathers began to fall out. This was serious. Breakfast would not be breakfast without fresh eggs. And so, in 1947, Coward spent a princely £2000 pinning back the chalk cliffs behind his house. The chickens were happy, and he was happy. All went back to normal, and they lived happily ever after until 1951, when Coward sold the place to another icon: Ian Fleming. Read Moonraker, and you’ll see the drama of the coastline in amongst its pages. Fleming loved the place as much as his predecessor. You can still hop on a bus from London Victoria and be at Deal, close to St Margaret’s, within a couple of hours. The number of the bus? Why, 007, of course. I wonder if Fleming retained the chickens. If you’d like to know more about White Cliffs and the time spent there by some of the great names of our time, catch up with this post from Dover Museum. 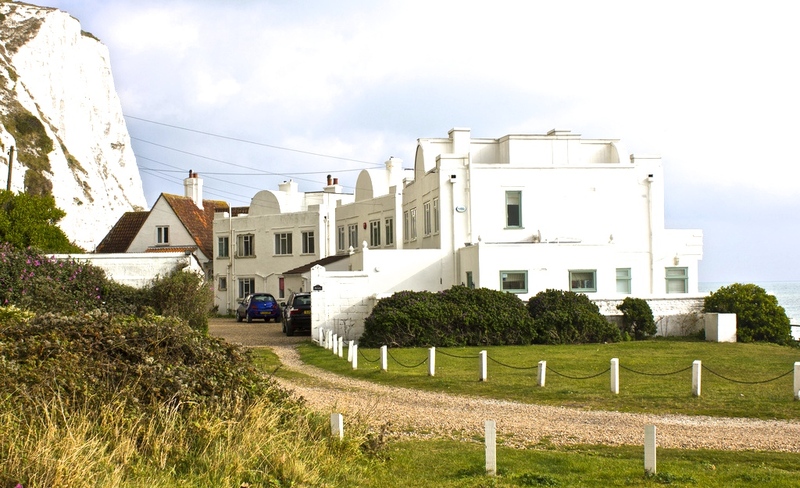 Posted in Literary lives, Places to visitTagged house parties, Ian Fleming, Noel Coward, St Margaret's Bay, White CliffsBookmark the permalink. Alas, Elspeth, I think I have to give the credit for that punchline to someone else. I have an undercover researcher on the Kent and Sussex coast. His timing is impeccable and when he tells that story he always ends it with 007. Honest answer – still a good post. I am reading H is for Hawk, Helen MacDonald – a book about many things – some about historic England and birds. Towards the end just after I read your post, a section about how hawks and falcons are sensitive to chalk. Amazing book. Maybe the chicken thinks the line is a S~N~A~K~E?! Unprompted, the snake explanation struck us, too. Except, when have you ever seen a straight snake? Unless you take a fake? I’ve had chickens…and they ARE stupid creatures. What a fun post. Another gem of tying unlikely threads together and coming up with a fascinating pattern. From fowl habits to a licence to kill. Ha! We used to draw lines on the sidewalk in chalk, for what reason I no longer remember. Maybe we were just playing “chicken”. Great post, Kate. I love the chalk paralysis! We used to have a Ridgeback who would not cross a line. I’m certain it must’ve been a related phenomena. When I lived in England, I reveled in all the Coward legacy. Sadly, I doubt many know who he was where I live now. Noel Coward wrote awesome dialogue and situational drama. And he was funny! Who knew he was obsessed with fresh eggs.